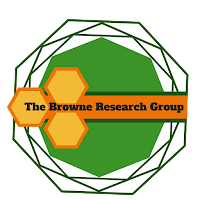 The Browne Group welcomes PhD Student David J. Cutress who joins the Browne, and Brophy (Aberystwyth) groups. Davids PhD is sponsored by the NRN Life Science Research Network Wales . David has the exciting/daunting (delete as appropriate) task of designing, synthesising and testing compounds that may inhibit liver fluke (a liver parasite). Davids project is entitled 'Towards validation of an immune suppressor protein from liver fluke as a drug target'. David studied genetics and biochemistry at Aberystwyth University IBERS receiving a first class degree along with the 'Society of Biology Top Student Award' after finishing his degree he was granted the 'Walter Idris Jones' bursary for a joint lab based project with the Geology and Microbiology departments studying novel glacial microbe species, in particular exosome vesicle activities.